Summer is an opportune time for many things: mowing the lawn, exercising outdoors, temporarily running away from all adult responsibilities (AKA going on holiday) and trying things you’ve never done before, such as falling in love or, you know, wearing a romper. Only kidding, you should never wear a romper. There are, however, other pieces worth trying this summer. Like those warm-weather staples you may have been putting on the long finger for fearing of royally effing them up. Well, now’s the time to take the plunge. These are summer’s most difficult wears, and how – according to the experts – you should wear them. 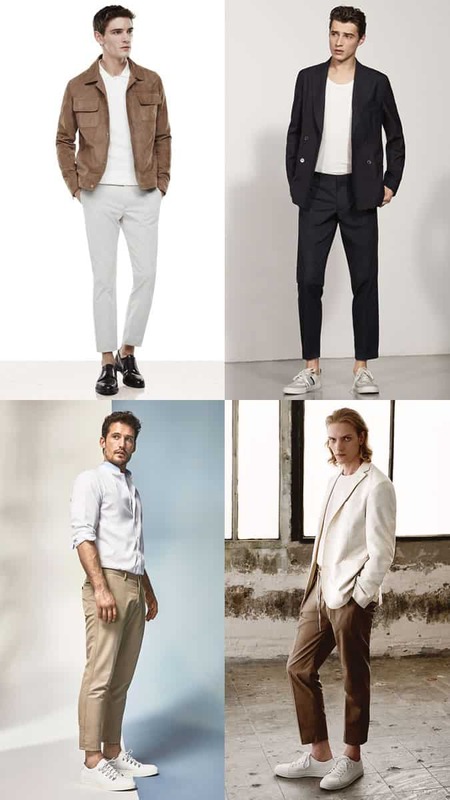 Cropped trousers have two main advantages: they allow air to circulate that sweaty shin-ankle area, and they proffer a welcome alternative to regular trousers, which although objectively fine, can get pretty dull if worn day in, day out. But tread carefully. Opt for the wrong crop and you’ll be left convincing your mum that no, seriously, you haven’t robbed her three-quarter threads. The perfect length for a cropped trouser ends a couple of inches above your ankle. For a smarter take, try a pair of classic Derbies. “If you’re going to wear socks with this slightly more formal shoe, make sure they’re plain (preferably ice-white) and not too short,” he adds. Most short-sleeved shirt #stylefails stem from one misconception: that they are basically the same as long-sleeve ones. Sure, there are a few instances where a shirt’s shorter cousin will do the job, but the safest way of styling one successfully is wearing it not like a shirt, but more like a T-shirt. The biggest misstep according to Arnold? Erroneous accessorising. “Avoid wearing one with a tie or any sort of neckwear; you don’t want it to conjure up NASA control rooms,” he adds. Like a tight T-shirt (only much less forgiving), a vest looks best on a body that’s seen the inside of a gym regularly beyond the first couple of weeks of January. But while a stellar set of shoulders, guns and abs (AKA the swolly trinity) will lay a solid foundation, only some savvy styling can transform this humble sportswear piece from frat boy to fashionable. “A tank top is best worn beneath an unbuttoned shirt or layered under knitwear,” says Arnold. “If you want to wear one on its own, then it needs to be part of a statement look.” Better book that PT session. A decade ago, men in florals conjured up images of, at best, Tom Selleck, at worst, Homer Simpson in that mumu dress. Now, though, prints and patterns inspired by flowers and plants are as synonymous with summer menswear as sandals. They’re still a damn sight more difficult to get right, mind. Opt for a larger floral print for the former and a smaller, more subtle print for the latter. It’s all about balance when it comes to prints, and florals are no exception. Go out on a limb with us here: what if your summer suit wasn’t grey, navy or black? What if your suit was, beige? Too far? Well, get used to it, because menswear’s current preoccupation with light, neutral colours such as stone and tan has grown beyond the confines of a Yeezy-inspired, hole-y longline T-shirt. It couldn’t hurt to work on your reflexes either: trust us, those pint stains are a nightmare to get out. There are two things you probably don’t want to look like when wearing denim shorts this summer: 1) Daisy Duke, and 2) a Gay Pride reveller circa 1999. Ensuring you look like neither is essentially a two-step process. Firstly, find the right fit and style. “Fit-wise, you’ll want a pair that’s not too tight, but not so loose as to make you look like the long-lost member of Limp Bizkit,” says style writer Miriam Bouteba. 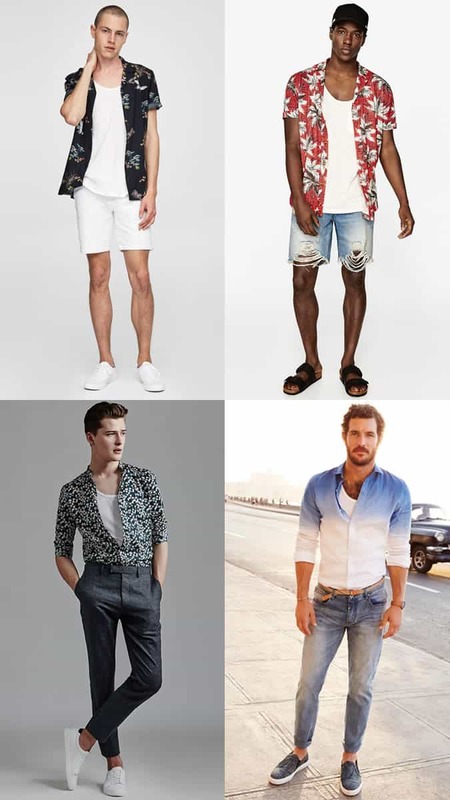 Most washes work but bear in mind that a pair of black denim shorts will prove much more versatile and generally user-friendly than a bleached pair with rips. Secondly, wear them with the right pieces. That’s a yes to a simple jeans and sneakers combination, and a resounding no a crop top. Resist any temptation to wear it with a hat. Unless the aim is to actively communicate to the world in no uncertain terms that the Man from Del Monte is your all-time style icon. Other than that, it’s pretty much plain sailing: wear yours with shirts, Breton T-shirts, lightweight chinos and chino shorts. And maybe invest in a garment steamer if you don’t want to spend your entire summer ironing or hanging out at the dry cleaners.